If you like roasted garlic, it’s so much less expensive to roast it yourself. (It tastes better too!) The roasting process is simple. Remove the white papery layer on the outside of each garlic head, but leave individual cloves still attached to the root. Slice a small portion off the pointed tops of the cloves. 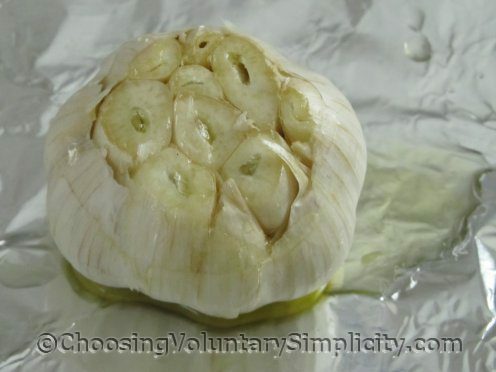 Place the head(s) of garlic on a sheet of aluminum foil, cut side up. Sprinkle with salt and pepper and the herb of your choice (or not). We like dried thyme and freshly ground pepper and only a light sprinkling of salt. Wrap the garlic head(s) in foil and place in a preheated oven. I set my oven to 375°F, but garlic can be roasted at temperatures as low as 350°F or as high as 400°F. My oven runs a little hot, and the 375°F works well for me. Roasting time varies from thirty-five minutes to nearly an hour, depending on temperature and the size of the garlic, so after the first twenty minutes check the garlic often so it doesn’t burn. In my oven and at the 375°F temperature the garlic roasts in slightly more than forty-five minutes. The garlic is “done” when the cloves feel soft and squishy. Or test for doneness by piercing one of the cloves with a knife… there should be no resistance. The tops of the cloves should be nicely browned. Let the garlic cool, then squeeze each head, squeezing from the bottom up. The soft pulp will pop right out. Roasted garlic can be stored in the refrigerator for up to two weeks… it also freezes well. I’m roasting garlic this very morning. I find that roasted garlic makes baba ganoush much tastier than raw garlic does! I want to try this because I do buy roasted garlic in the jar and it is expensive. I did this once a long time ago and as I remember the garlic was not like what I buy but after reading your instructions I’m quite sure I didn’t cook it long enough. I will try again with hopefully better results. Great idea and something I should do. We like roasted garlic on pizza and use a lot of it because my sons like pizza so much.